I’m still alive! The Dandies were at the Blyth Festival of Wizardry on September 21-23 and I had a lot of prep that went into the weekend for costumes and props (more on that later). Then there was the inevitable crash after the festival. Since we had just gone through FanExpo at the beginning of the month….well I crashed hard. This past weekend I had (still have?) a migraine off and on for 4 days. I am still not certain it is gone… It is raining today, though, which is usually a good sign for some relief from migraines. My Summer sewing plans were kind of thrown out the window by health issues and festival prep. I did manage to get about half of it done or cut out. I still hope to get them done at some point since they work for transition weather or with a cardigan throughout winter. This Burda Praire Style dress has been on my list for a while and it’s pretty trendy. I am torn on fabric, though, since I would love to use a small scale floral, but that requires buying it and a lot of small scale florals are only in quilting cotton locally. I could use some polkadot chambray I have, but I am not certain I want to use it for this project. The dress view of this pattern looks lovely. 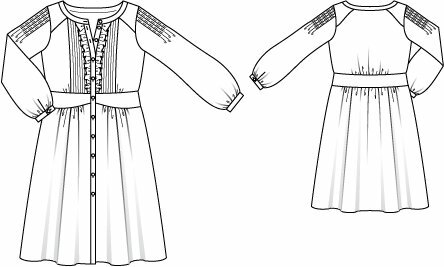 I’m hoping to get this done this week and posted for the Monthly Stitch Indie Pattern Month dresses week challenge. Holy moly, that’s a mouth full. I have some hunter green jersey for it, but I can’t decide whether to play with some colour blocking since it’s a perfect pattern for that. Since my style is evolving, I’ve noticed that I want more blouses in my wardrobe. 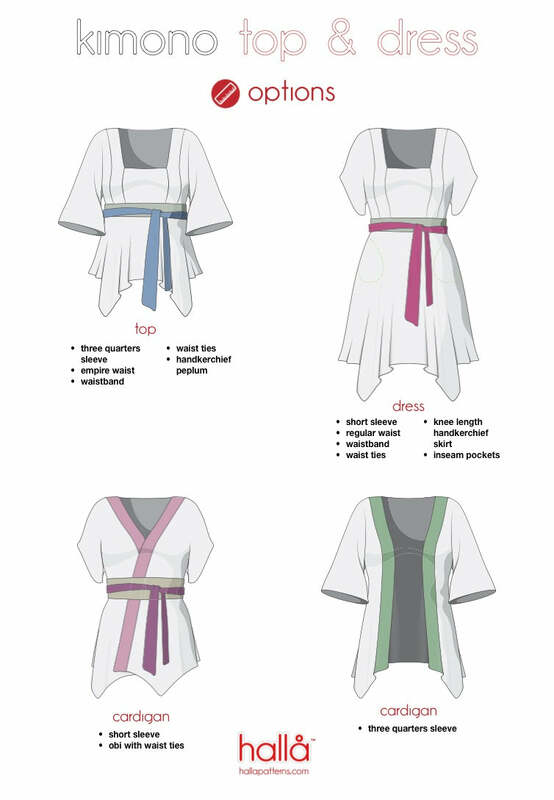 I’ve been wanting to make the Seamwork Arden for a while now, but I realized that I don’t really want more dresses. Plans are to shorten this to a blouse length and omit the darts for more volumn. I have some white rayon with navy polkadots that I plan to use for this top. 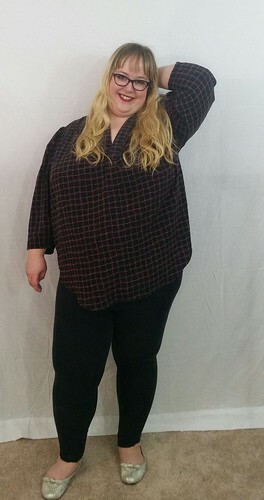 Similar look, but using a knit fabric is this Hot Patterns Metropolitan Tie Me Down top that I found in a local thrift store. It’s uncut! I’m excited to try this out, especially because I have never done shirring before. Since making this McCall’s 7094, I have worn it a LOT. It’s definitely a top choice for me. I’m going to make some pattern adjustments since the fit is not 100%. I will do a “dowager’s hump” adjustment. I don’t really have one but the places the adjustment adds extra room are where I need it. This makes sense considering the pattern is designed for people who are much smaller than me. I also would love to add more length to the sleeve and a small cuff and button. I have two soft “velvet” drapey satins that would be perfect for this pattern. I plan on making some more of these Cashmerette Cedar Dolman ruffle sweaters. I just made some ponte trousers using the Misty Jeans pattern that I have made several times before. They are super comfortable and great for work as well (secret pjs!). I hope to get some more ponte in some patterns to make more. I have some grey knit and was thinking of making them with flared bottoms. 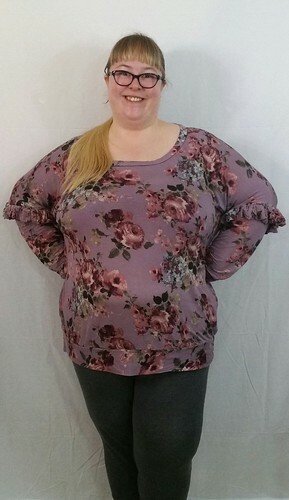 McCall’s 7726 is a popular pattern right now. I have dreams of using some lovely magenta rayon twill that I got from Blackbird fabrics earlier this summer for view D. I’m thinking, though, since this pattern won’t work in the winter with boots that I may wait until February or March to make these. That’s probably going to be the case since I will have holiday sewing to do pretty soon. Now here is where my dilemma lies. 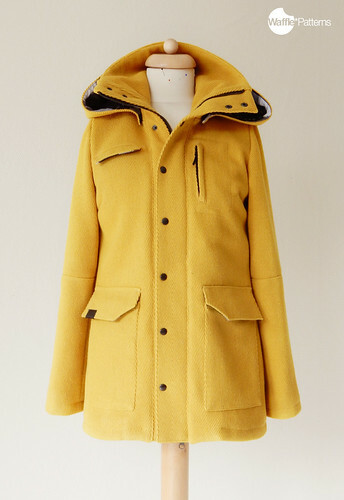 I keep waffling on which pattern to use for a new winter coat. Waffle Patterns’ Tosti utility jacket seems like a great choice. I have some lightweight light blue wool and thinsulate for lining. But…. I am not sure about the shape for me and I would need to grade it up quite a bit. UGH. But I do love my Pepernoot coat and find Waffle Patterns to be really nice patterns. I also love this Ottobre coat from the 05/2017 issue. It’s such a lovely design. I would still need to grade this one up but more like 2 sizes instead of 4 sizes. The impulsive part of me is thinking… well…..why not both! ?